span of the same week. Monday, Tuesday, Thursday, Saturday. A project in the spirit of Wagner, who fulfilled his dream of an integral performance of his Tetralogy in the new Festspielhaus in Bayreuth between 13 and 17 of August 1876. 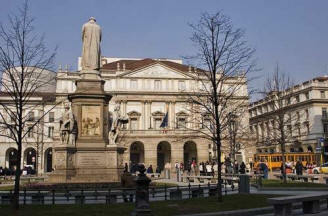 In the year that brings Verdi and Wagner together in the bicentenary of their births (1813), the Teatro alla Scala is to include a double Tetralogy: for all true Wagnerians and opera lovers everywhere, a full immersion into the most visionary journey ever to come out of the musical theatre from Monteverdi to the present. Four different stage settings linked in a single project created by director Guy Cassiers, under the guidance of one of the greatest interpreters of Wagner, Daniel Barenboim, and with four casts of excellent Wagnerians, well-known to opera-goers around the world. Packages available including tickets for all 4 performances for the week of your choice in different seating and hotel categories! Limited ticket availability - early booking required! A welcome cocktail in the theatre foyer on the opening night of the Cycle chosen. A pre-paid voucher for a packet lunch during the interval of Die Walkiere. Access to the exclusive lounge in the Theatre Museum during all intervals. Invitations to the cultural events organised by La Scala during the week of the Cycle chosen. A limited edition playbill of the Cycle. or The programme of the Cycle. A selection of short videos and pictures of Der Ring on a USB flash drive. or � Further information on Der Ring directly to your email address. or A limited edition playbill of the Cycle. collected in the theatre during the Cycle. Further information on Der Ring directly to your email address.